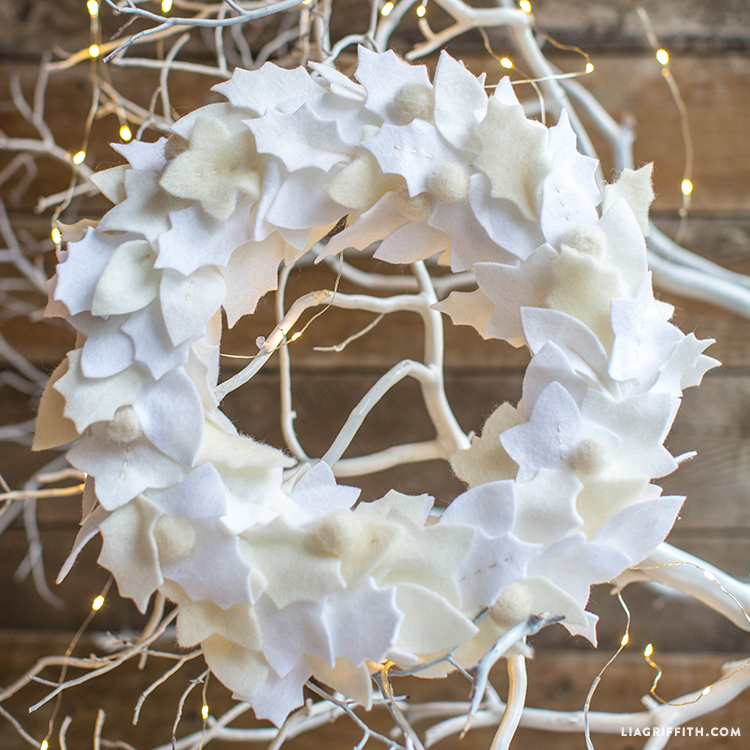 Our frosty felt wreath is oh-so-pretty in various shades of white and cream. 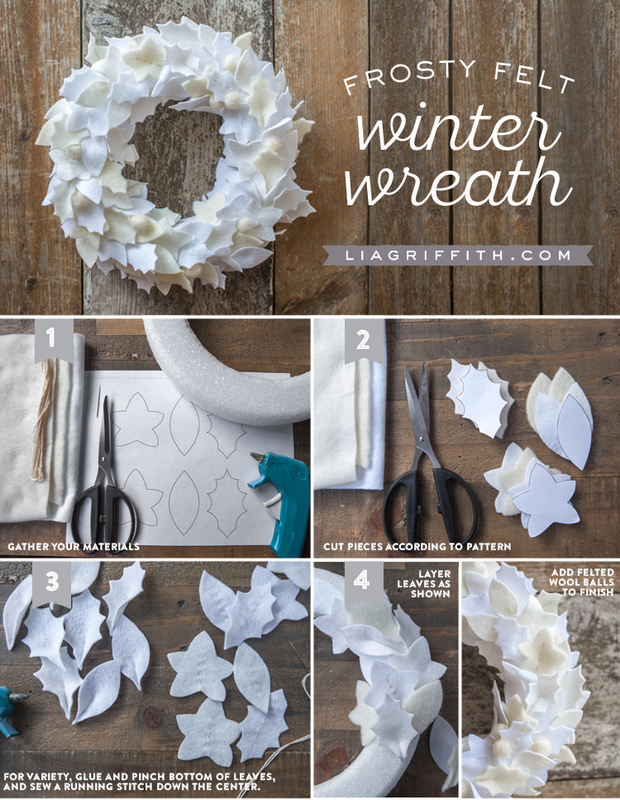 This is a simple DIY wreath that anyone can make at home. We used a 12″ foam wreath which we wrapped in white ribbon to start. Using our downloadable templates, we then cut leaves in three different shapes out of various shades of wool felt. Next, we added a running stitch to the holly leaf in a white embroidery floss to add a little extra detail. We pinched the stems of half of the holly leaves and secured them at the bottom with glue to give depth and dimension to the top layer of our wreath (you don’t need to do this with the bottom layers of leaves!). 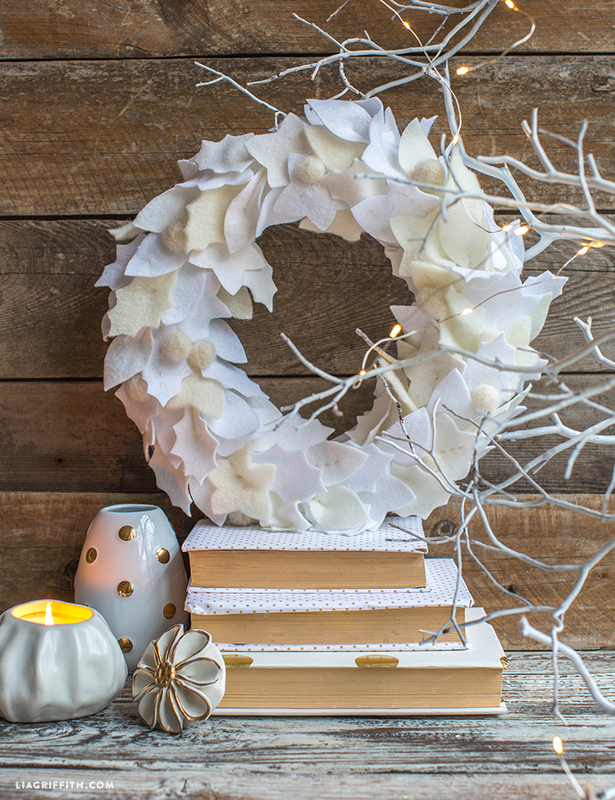 The easiest way to secure the felt leaves to the wreath is using a low temperature glue gun but you could also use fabric glue. Finally, we added little white felted balls as berries to complete the winter wonderland look. You can find the tutorial for the felted balls over in this post. We love seeing your creative endeavors so if you use any of our patterns or templates to make something beautiful, please do share your pictures with us on Facebook, Twitter or Instagram using the hashtag #DIYDreamingWithLia and we will share our faves! Is there a way to have a svg file? This may be a dumb question but how does a wreath like this do outside in the elements? We don’t have a screen door or a roof over our front door but I love love love this wreath! That’s not a dumb question 🙂 You’ll want to keep this protected from the elements. We haven’t found anything so far to waterproof felt or paper but maybe one day will find something that works! I recently found your website and besides of the many projects I am going to try, this one totally got me for its simplicity and loveliness. Perfect gift for my mom as she has been asking for a new Christmas wreath this year! Thanks, Lia! I does depend on the base size and how close you glue them together. For ours we used about 80 leaves. This is so beautiful, think it could still hang gloriously well after holidays. Surprised not to see many praising comments already on here. Have printed it out for after recovery for something to look forward to doing. Hope that’s not all winter, lol. or I’ll go crazy just sitting, not crafting. Hope it’s as beautiful out today there as it is here. Just chilly with slight breeze, our chickens love this weather, they’re out terrorizing the yard finding bugs in dying grass. Have been packing up most all of Fall decorations while time is to have. Will be busy week finishing up holiday decorations to give/use in our house. Didn’t want to leave putting Fall decorations away til last minute so they could be packed up nicely for next year, not just thrown in box. I like to keep same kinds of things together, makes getting them out so much easier next year.